The Solano Avenue Association takes over the Albany Twin Theater Sunday the 10th to celebrate the Lunar New Year with an event that is colorful, inspiring, and always popular! The event starts out with breathtaking performances at the Albany Twin Theater from 10am to 11:45. Then the festivities move outdoors with a parade along Solano from noon to 1. 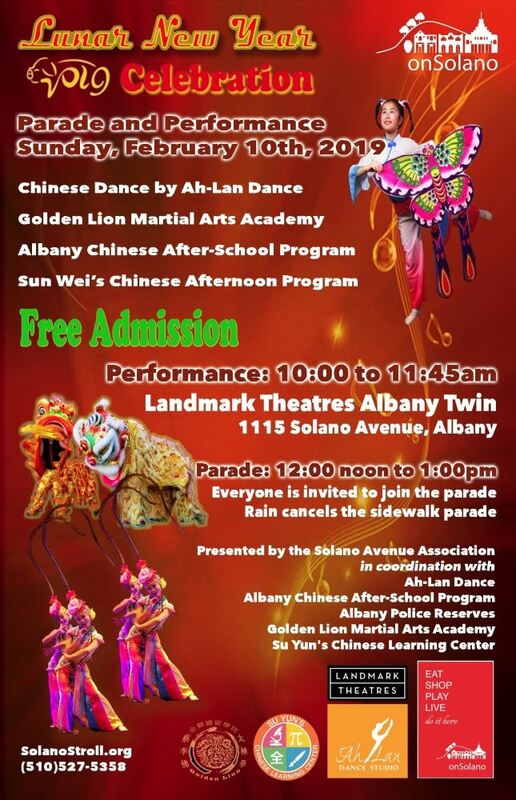 Presented by the SAA in association with Ah-Lan Dance, the Albany Chinese After-School Program, Golden Lion Martial Arts Academy, Su Yun's Chinese Learning Center, and with the help of Albany Police Reserves, this is an event you won't want to miss!